Martian Manhunter watches as the heroes rally outside of China preparing to take down Black Adam once and for all. He listens to their idle banter and concerns, then emerges to lead them into battle. Monitoring the world as they consider action against Black Adam (including nukes), Manhunter leaps into the fray, battling Black Adam after Adam has decimated most of the heroes in his path. Manhunter manages to maintain toe-to-toe with Adam using Martian Vision and his strength, but ultimately it is the combined effort of all of the heroes that allows Captain Marvel to hit Adam with the lightning, disconnecting them all and stopping Adam once and for all. Martian Manhunter falls, changing into the now-familiar One Year Later version of himself. In space, the Monitors note this and indicate that these heroes must evolve to stop what is coming. Story - 3: It's really sad, to me, that one issue of 52, issue #50, was better for me than all four of these issues. It tells the story that these four issues chronicle, and with as much passion, but without a lot of decompression that wasn't really necessary, in my opinion. Don't get me wrong. I love the Martian Manhunter, at least, I did before they went to the LCD plot device of choice for both Superman and the Manhunter, "I'm an alien in a world that doesn't understand me!" It fails with Supes, and it fails critically with Martian Manhunter, because they're both essentially Data style figures. You never see Data going machine for six episodes just to be edgy, because it would be ridiculous. Same with Manhunter and Supes. Manhunter is one of us. Otherwise, why even stay on Earth? That's the end result of this story, however, not this story. I just don't like that that C follows from this A and B, because I don't see it following. If anything, his last-minute rally against Black Adam would renew his fervor of trust in humanity, given all the good he sees that pulls him in at the last minute. This series, as I read it, didn't really do what it was promoted as doing. It also wasn't what I'd hoped it would be. That might be a byproduct of my heightened expectations, but it might also be because it was a lemon with great garnish. I expected an all-out battle between Black Adam and the entirety of the super hero community. Instead, I get a lot of great splash pages interspersed with an internal monologue that goes on for 88 pages. No real strategy, just people throwing themselves at Black Adam with Martian Manhunter commentary. It's very pretty, and it's even often poignant, but I had this little stack of books in my hands, along with issue #50, and I thought, going in, with expectations built up from the previous 49, that this would be an earth-shattering conclusion to the Black Adam storyline. Instead, it was like the video game for a major motion picture that ducks behind the main action and tells a side story, which is too bad. It's not that Martian Manhunter is a bad character to see this through, or even that it was poorly written. It was well written (note the rating), it just wasn't epic. It wasn't bad, it wasn't good, and when you're expecting a truly epic story that is continuity defining (for instance, that declares most of the rest of why One Year Later was One Year Later without simply a cursory panel or two for most of the changes (which was already present in all of the One Year Later stories, notably)), and instead you get a character study, it's disappointing. Especially given that this is the Manhunter that I enjoy, but this story signifies, erroneously (in my opinion) the end of that character for now. The Great Ten were unutilized. Most of the heroes present had no purpose beyond background. The battle with Black Adam was pure fists. It was exciting, yes, but it lacked that critical plot quality that would push it over the edge to great. It's rare that I say, "Man, there was just too much character in there!" That's not the case here, actually. It's more that there was an overabundance of character and very little augmenting plot. It seemed stretched. Issue 50 of 52 did this whole thing much better. Plus, if they all come out on one day, why not throw a trade in there? I'd have bought the trade. It seems unnecessarily divided. Either way, this is a good story, but it's not what I had hoped for, by far. It's still worth a read, but it won't come out of the box again. I had hoped for this to be pivotal. Art - 5: Story regardless, the art is top-notch on all fronts. Every attack, every panel is epic. It speaks to a higher quality of event than this is, which is a bit frustrating, but more toward the story end. Every panel smacks of professional quality, poster material. This is truly great art, and I've now got a solid eye on Jadson. Where has he been, and what has he done before, because it's a shame he hasn't been to this level in my open view yet. Great stuff. Cover Art - 4: Most of these covers have very small, truly compelling images that make you want to pick up the issues. Sadly, most of them happen in other ways or don't happen at all. 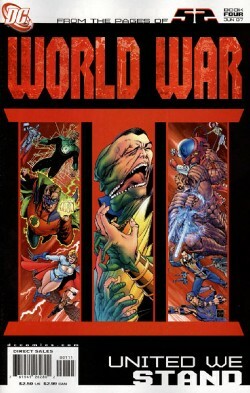 On this cover, Black Adam and Martian Manhunter are shown merging, the Great Ten are going on the attack, and the JSA jump into the fray. One of these three things happen. They're all compelling, and the covers are really neat and eye-catching. I wish that the story had reflected how cool these images make it out to be.